VATICAN CITY (CNS) — From the moment Pope Francis said, “We declare and define Blesseds John XXIII and John Paul II be saints” and “they are to be venerated as such by the whole church,” their October feast days automatically could be celebrated at Masses around the world. St. John’s feast day is Oct. 11, the anniversary of the day in 1962 that he opened the Second Vatican Council. St. John Paul’s feast day is Oct. 22, the anniversary of the inauguration of his pontificate in 1978. 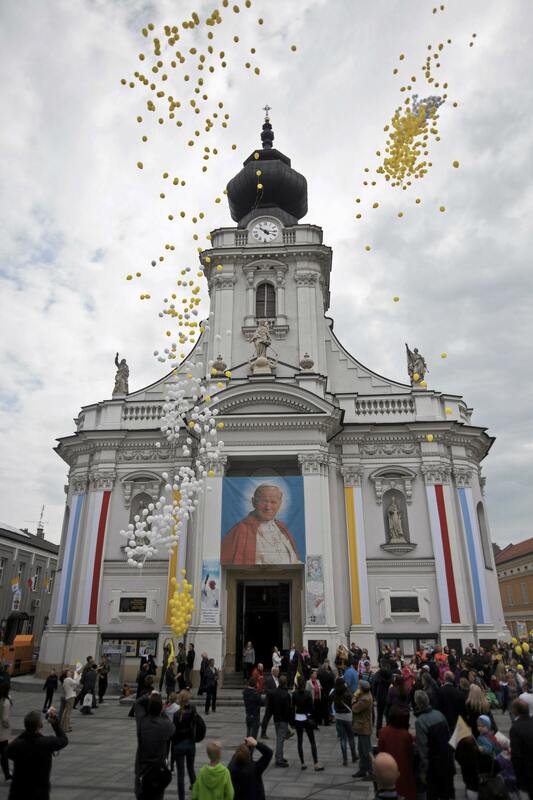 After the two were beatified — Pope John in 2000 and Pope John Paul in 2011 — special Vatican permission was required to publicly celebrate their feast days outside the Diocese of Rome, where they served as bishop and pope, and their home dioceses. Vatican permission also was required to name parishes after them, but with their canonization, that is no longer necessary. — At a canonization, the pope issues a formal decree recognizing the candidate’s holiness and permitting public remembrance of the candidate at liturgies throughout the church. — With a beatification, the pope concedes permission for limited public remembrances, usually among members of the candidate’s religious order or in the diocese where the candidate lived and worked.